Showing results for tags 'blueberry'. Celiac.com 11/16/2018 - Who doesn't love a perfectly made French meringue? And perfect is the only way to describe Alice's Sweet Tooth French Meringue Kisses! 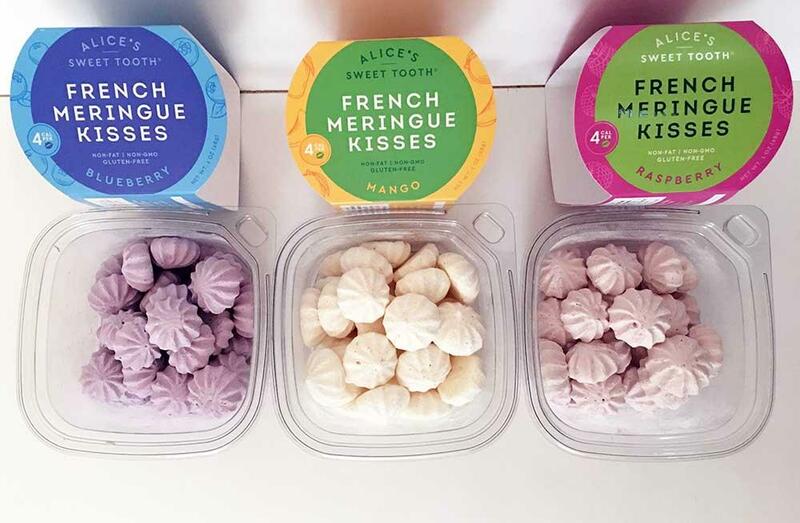 Alice's Sweet Tooth creates an amazing assortment of naturally gluten-free kiss-sized meringues, including blueberry, raspberry, mango, chocolate chip, vanilla bean and cocoa. Each variety exactly captures its essence, the blueberry flavor explodes with the taste of fresh blueberries, the mango flavor tastes like fresh mangoes...and the raspberry flavor tastes like real raspberries, right down to the slight tartness that all raspberries have. These meringues will melt in your mouth...there is just no need to bite them...just pop one in your mouth and let it melt on your tongue! If your plan is to only eat one or two you might as well forget it, because it won't happen! I was a half box into them before I realized it, mainly because they are incredibly light and non-filling. Alice's Sweet Tooth French Meringue Kisses are made with organic ingredients, and are a perfect treat for any occasion. Each variety offers an over-the-top flavor experience that just can't be described...you really just have to try them! For more info visit their site. My first impression after trying one of The Bakery Gluten-Free Blueberry Muffins was that these muffins are super-moist, and taste great. They really do taste just like the blueberry muffins that I used to eat before I had to cut out gluten, right down to the chewy consistency, lots of blueberries, and the cake-like flavors and mouth feel. These muffins are also traditional in size, which means they are pretty big, and this is great because so many gluten-free products are smaller than their normal wheat-containing counterparts. Just one of these muffins left me satisfied. 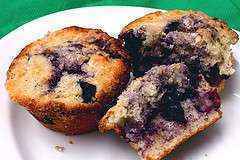 The Bakery Gluten-Free Blueberry Muffins are available in the bakery section of your local Walmart. For more info visit: Walmart.com. Review written by Scott Adams. This recipe comes to us from Mary Guerriero. 1 cup brown rice flour ½ cup potato starch flour ½ cup tapioca flour 2 teaspoon xanthan gum 2 ½ teaspoon Baking powder 1/3 + 1 T. sugar ¾ teaspoon Salt ¼ cup applesauce 2 large eggs, lightly beaten ¼ cup canola oil ¾ cup nonfat milk ½ teaspoon Vanilla 1 ½ cups fresh or frozen Line muffin tins with paper. Stir together dry ingredients. Make a well in center of mixture and add applesauce, eggs, oil, milk and vanilla. Stir together just until ingredients are moistened. Gently fold in blueberries. Divide mixture into muffin tins and sprinkle with sugar. Bake at 400 degrees for 25 minutes. Makes 12 muffins. As summer comes to an end, this fresh salad is a great way to capture the last of the sunny months. Citrus brings out the best in beets and compliments the sweet blueberries. The creamy dressing pairs nicely with other fruit as well, I like to make a little extra for my lunch or breakfast. Ingredients: 1 pint blueberries 2-3 beets ½ cup plain yogurt Juice from 1 orange, divided ¼ cup feta cheese 2 tablespoons olive oil 2 teaspoons fresh lemon juice 2 teaspoons fresh thyme, minced Salt and pepper to taste Directions: Preheat oven to 400°F. Remove the tops and roots of the beets and peel them. Cut beets into ½-inch chunks and spread out on a baking sheet. Toss with olive oil and thyme. Roast for 30-40 minutes, until tender. Remove from the oven and toss immediately with half of the orange juice, and season with salt and pepper. Set aside to cool. Meanwhile, in a medium bowl, combine yogurt, lemon juice, remaining orange juice and another pinch of pepper. Add blueberries and beets and toss until well-combined. Top with feta cheese and serve. This is a recipe that you can't go wrong with. Easy to make, lightand healthy, no refined sugar, gluten, eggs, or dairy. What awonderful way to use all the berries that are popping up this summer.Try this recipe as it is written, or substitute with whatever berriesare abundant in your area. Blueberry Honey Pie with Honey Whipped Cream and Raspberries (Gluten-Free) Blueberry Filling Ingredients: 6 cups blueberries ¾ cup honey 2tablespoons + 1 teaspoon arrowroot powder ¼ cup water 2teaspoon lemon juice 2 teaspoon coconut oil ½ cup raspberriesfor topping pinch salt To make filling: In a large saucepan, mix blueberries, honey, and salt. Add waterto arrowroot powder in a small bowl and blend. Add toblueberry mixture; blend. Stirring often, cook over medium-high heatuntil mixture is bubbly and arrowroot-water mixture turns blueberrycolor, about 2 to 5 minutes. Stir in lemon juice and coconut oil. Cool slightly and pour into your already prepared pie crust. Chill at least an hour. Serve with honey whipped cream. Honey Whipped Cream Ingredients: 1 cup coconut “cream,” from a chilled can of full-fat coconutmilk ¼ cup honey To make whipped cream: The day before you plan to make this pie, chill one can of coconutmilk, your mixing bowl, and beaters in refrigerator. Skim about onecup of the “cream” off the top. Add the coconut cream to achilled bowl. Whip coconut cream with chilled beaters until it reaches itswhipped cream state. Gradually add honey. Whip again until it turnsto whipped cream with at least soft peaks remaining when you stopwhipping. Spoon onto chilled pie, leaving a perimeter of blueberriesexposed. (Chill whipped cream if you are not topping your pieimmediately.) Top whipped cream with raspberries. Raw Nut Crust: The following raw crust recipe is ahealthy alternative to flour crusts. However, you can use yourfavorite crust for this recipe and it will be just as good. Crust Ingredients: 2 cups finely ground raw soaked almonds ⅓ cup honey (or agavenectar) To make crust: Combine 2 cups finely ground raw almonds and ⅓ cup honey inmixing bowl. Press into lightly greased 5-inch pie dish. To Assemble Pie: Fill pie crust with berry filling and top with honey whipped cream and berries. Serve chilled and enjoy a little piece of heaven! This recipe comes to us from Chris Spreitzer. 1 cup softened butter or margarine 1 cup sugar 3 eggs 1 cup sour cream 1 teaspoon gluten-free vanilla extract zest of two medium lemons juice of one lemon 2 ½ cups gluten-free flour mix 1 ¼ teaspoon xanthan gum 2 ½ teaspoon baking powder 1 teaspoon baking soda 1/8 teaspoon salt 2 cups fresh blueberries Topping: 1 cup chopped pecans ½ cup sugar 1 teaspoon cinnamon Cream together butter and sugar. Add eggs, one at a time, mixing well after each addition. In another bowl, mix sour cream, vanilla, lemon zest and lemon juice. Combine gluten-free flour mix, xanthan gum, baking powder, soda, and salt. Alternately add flour mixture and sour cream mixture to creamed mixture, about a third of each at a time. Stir in blueberries. Dough will be fairly stiff. Spread half in a greased 9x13x2 glass baking pan. Combine topping ingredients, sprinkle half of topping mixture over dough. Carefully spread remaining dough on top of topping. Sprinkle with remainder of topping. Bake at 350 for 35-40 minutes or until cake tests done. Yield 16-20 servings.